Did you hear? Hear what you say? Grey is heading out. Maybe you've heard, or maybe you're just hearing this. But either way, you're probably stressing out a bit. But my whole house is grey, my kitchen is grey, what can I do?!! First, remember, there's always phases in design. Things come and go, but you can work with what you've got. How cute are Poppy and her dad, Jeremiah. If you haven't watched Nate and Jeremiah by Design yet you need to binge watch season 1 because season 2 begins on April 7th on TLC. What I really appreciate about their show verses other design shows, is that one, they don't all look the same. They take their client's style and makes a home for them, not just a "flip style" home. Secondly, they show what it actually costs to do a design project. Most design show pricing is soooooo not realistic with their budget. If you want to see their past New York home click here. Oh my heavens that curved island! I know your eye went straight to it too. Could you imagine 2 of those chandeliers over this island?!! 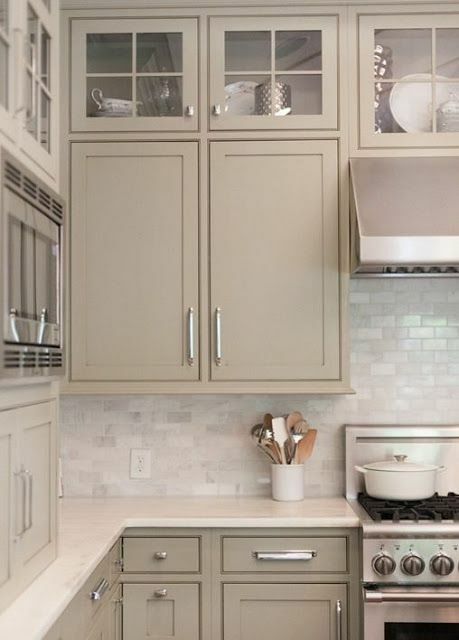 Polished nickel and aged brass look good with taupe cabinets. This is a christopher peacock kitchen. You don't know christopher peacock? well he's the gold star of all kitchen cabinetry. I first fell in love with his artistry and quality during my internship in London. 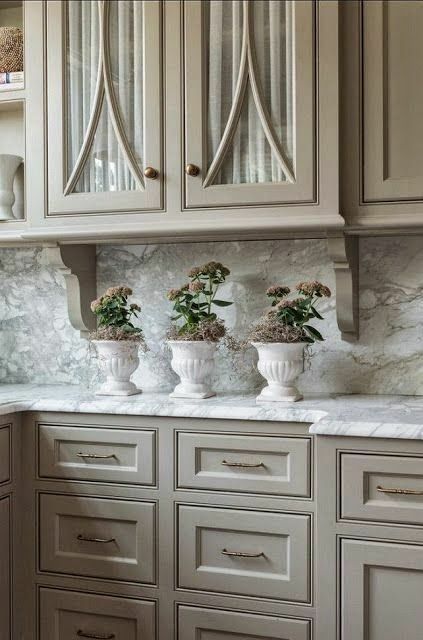 I like the crispness of the white backsplash and countertop with the nickel hardware. They all help lighten the kitchen up. This was designed by Tobi Fairley from my hometown. It's a penthouse with some bold looks and an even bolder entry. 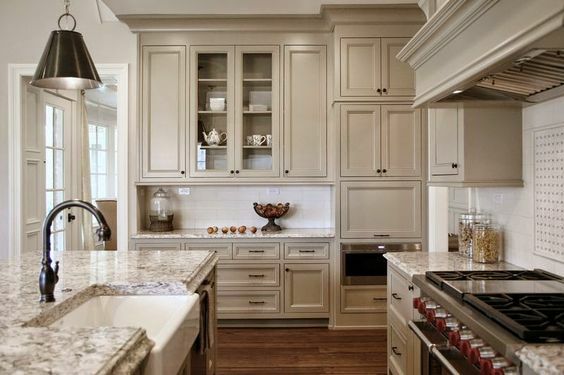 Note how this countertop and backsplash have grey undertones. 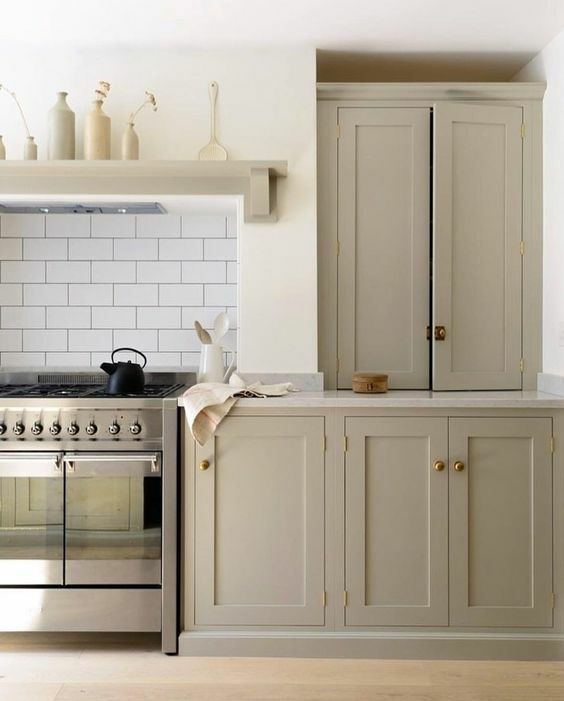 it is possible to tweak your kitchen with not a lot of money. 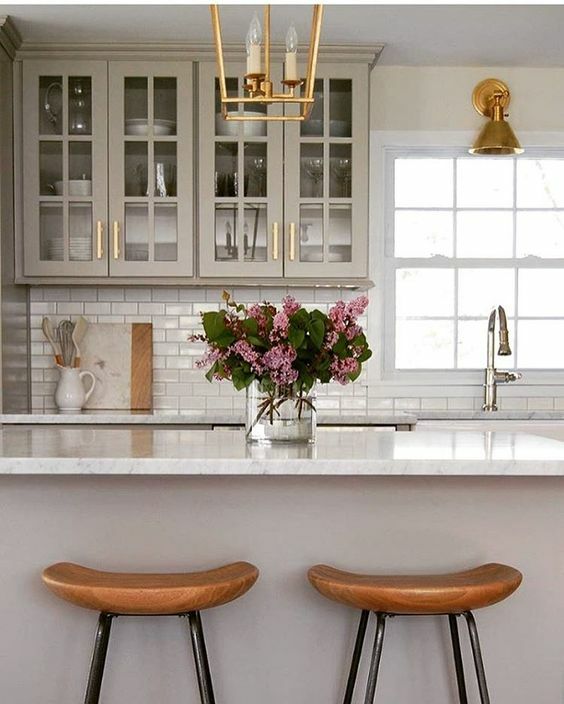 Oh those stools and brass bring so much warmth to this space. 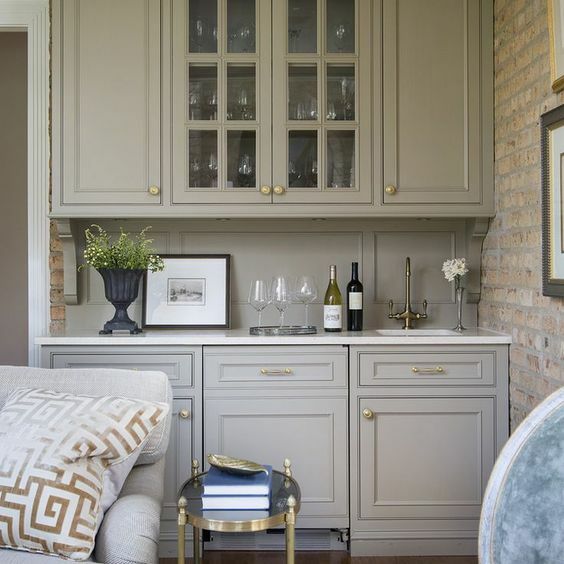 This is technically a mini bar area, but the paint color really works with the mortar color of the bricks. I also learned about Smallbone of Devizes when I was in London. This is from their hand painted collection. I sure love a white kitchen, but now have the itch to paint. It might be time to get the boys' bathroom cabinet painted in taupe.